Comics' Lost Classic Finally Finds A Home? The big news from Marvel at San Diego this year is that they've purchased the rights to the long-lost legendary character Miracleman, home of some of Alan Moore and Neil Gaiman's earliest published work. The rights to the series have been in dispute since the collapse of publisher Eclipse in 1994, in part because rights were believed to be shared between all creators, Eclipse - whose intellectual property was bought by Spawn creator Todd McFarlane shortly after Eclipse declared bankruptcy - and original creator Mick Anglo. As the first major superhero work by Watchmen's Moore, with later writing from Sandman's Gaiman and Fables artist Mark Buckingham, the series had a good reputation even before it fell out of print for more than 15 years. This isn't the first announcement of a return for the character; Todd McFarlane brought the hero's alter-ego Mike Moran back in a 2001 issue of Hellspawn, but copyright challenges caused that storyline to be truncated prematurely. It's unclear from Marvel's announcement whether their new ownership includes the Moore/Gaiman work. Marvel's announcement talks about Anglo's involvement in the purchase, but it's possible that the new agreement only covers new stories done with the character, as the rights to the classic Moore and Gaiman runs were previously believed to be at least partially held by the creators themselves. 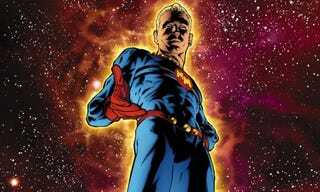 Most tellingly, Marvel are reviving the character under his original name, Marvelman, which was previously changed in 1985 due to - ironically - concern over legal action from Marvel Comics; the famous Moore and Gaiman stories appeared under the Miracleman title. Marvel promise more information on the deal soon, but we can't help but wonder if they're not explaining all right now because the specifics may make the announcement less exciting. Time will tell; here's hoping we won't have to wait another fifteen years to see Miracle - or Marvel - man again. Many thanks to Carla Hoffman.